One of the joys of being a serious collector of song-poem records is that I'm never sure quite what I'm going to run into, and today I'm offering up a recent find that comes from the "what the hell was that" file. Song-poem mania has already led me to the ownership of a big collection of 45's on the Fable label (shared here and here), many of which are not song-poems, but which share some of the oddness of that genre. Sandy Stanton, who ran Fable, later turned his talents towards the Film City label, where, among other things, he bought a Chamberlain and hired young Rodd Keith to be a one-man-band on most of the new label's releases. While most of Film City's 45's do indeed appear to be song-poem records, Stanton also farmed out Rodd Keith's talents to those wishing to make vanity records of their own compositions. These are distinguished from the label's song-poem releases primarily by the fact that on the vanity releases, the singer and the songwriter are typically the same person. As far as the sound, though, they still carry the standard Film City "Swinging Strings" sound, which is a unique one, peculiar to this label and its offshoots. The key feature is the mechanized sound of Rodd Keith at the Chamberlain, one of my favorite musical sounds ever desived. I have no direct knowledge as to whether these vanity records feature a Chamberlain overdubbed onto existing tapes sent in by the songwriters, or if the writers came in and performed live in the studio with the Chamberlain. I suspect that for today's record, by Lana Johnidas, that she (Lana) was in the studio with whoever was playing the chamberlain (almost undoubtably Rodd Keith). However, I've heard other vanity records from the Film City family of labels in which I believe additional Chamberlain flavoring was added to a previously recorded song. Today's record is both typical in that it features two examples of amatuer songwriting and singing, accompanied by two of these weird backing tracks, and yet also unique, in the utter weirdness of the song "Scotch Tape", and the equal weirdness of the vocal performance by the author of that song. Whoa, that is one weird record. I'm trying to imagine somebody dancing in the basement to it, but I just can't manage it. Oh, no! Now it's stuck in my head. Like, like... scotch ta-a-a-pe. Help! Thanks for uploading this lovely track! Bob Storm is my favourite from your collection so far. With everybody knowing about the song-poem world giving "nom-de-whatevers" to singers, maybe this is too easy to throw around, and I understand I may be wrong. 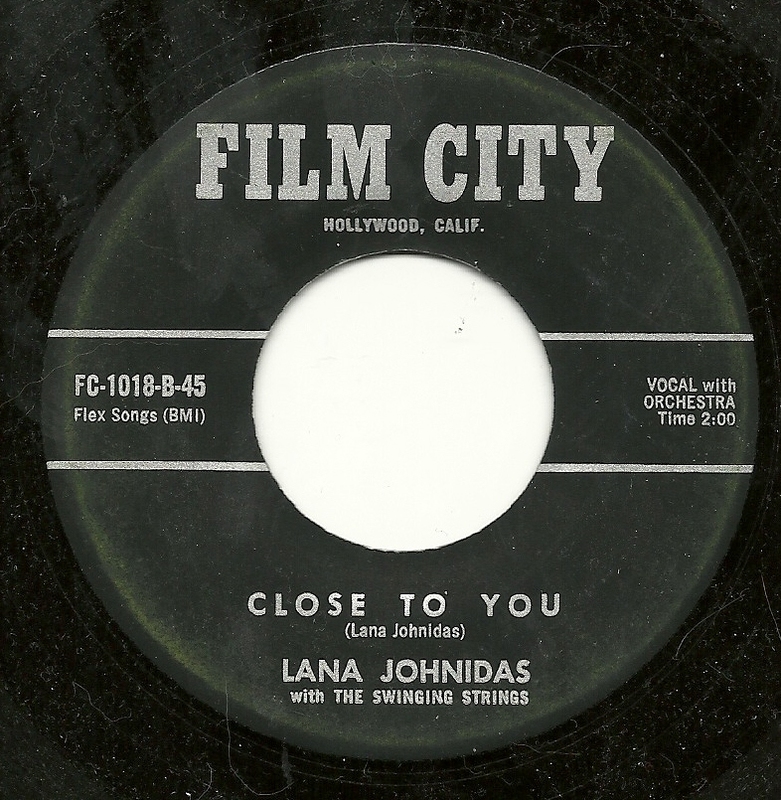 This "Lana Johnidas" sounds to me (who might be wrong, again) a lot like Nita Craig. * Whenever I hear "Scotch Tape" immediately followed by "I Have a Number", there seem to be similarities to me, anyway. One thing they both had was this vibrato when they held a note long enough. *"Nita Craig" was itself a "nom-de-whatever", her actual name being Nita Garfield.